Eggplant is a fruit. 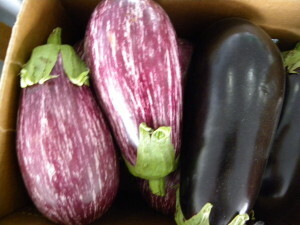 A multiple of eggplant varieties are available. Great for stuffing, fried, baked, steamed, grilling, eggplant rolls wrapped with prosciutto & mozzarella. Eggplants are a key ingredient in Asian, Italian, Middle Eastern, Indian, and Greek dishes. BABY Most tender of all Eggplants, but are perishible. PURPLE Most common. Excellent substitute for meat. WHITE Dense, creamier, less bitter, more seeds, but firmer that the purple. When selecting Eggplant they should feel heavy, and firm. Glossy and unblemished skin. No pits dents or wrinkles. Always cook Eggplant before eating. Rinse, cut off stems and cap. Dipping in salt will help remove the bitterness, excess moisture and to prevent excess oil absorption when cooking. After slicing Eggplant discolors when exposed to air.